Oooh, this is very cool. Cyberpunk, post-apocalyptic mushroom town! I like the idea and the composition looks great. I'm looking forward to see how it evolves. 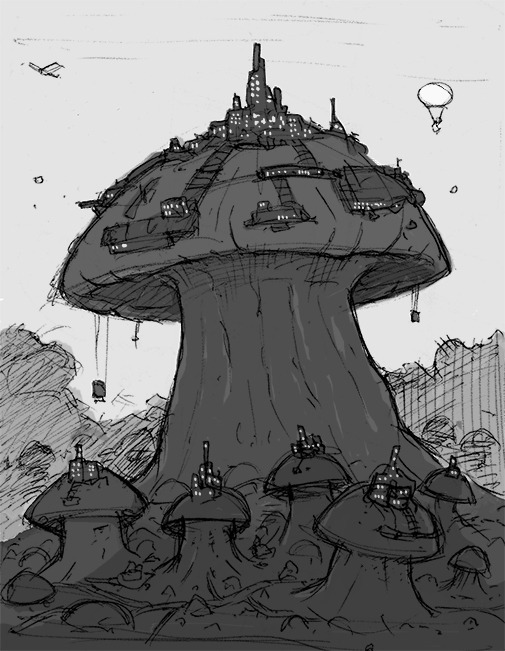 It's just an though, but it would be cool to see a lot of chimneys built into the mushroom as though they are using them as a power resource or extracting something from them. There are chimneys, but I was in a rush this morning and just covered everything in little white dots without thinking. So those towers with windows/lights on them were suppose to be chimneys. @johnmk Ha, love it! I'd like to see that. @johnmk ooh! I like this a lot. Unexpected concept.